I also decided to start a couple new things. The first being Mrs. Waddelow's Needlework Basket. I finished up the ruler. I mainly wanted to see how the coverage would be using only one strand and I think it will be okay. The other thing I decided to start is "All Our Troubles" by La-D-Da. I have always loved this design and when I saw Cathy's progress on her blog the other day, I knew I had to stitch it. Well, it's been a difficult week for Lisa's family and friends. I know I have been up and down a lot. I'm so glad that I have you all and my stitching to bring me comfort and joy. Thank you for all your kind words. They really mean so much! I've thought about you often...I know that emotions of this kind can be overcome and will ease with time, but the heart never forgets. Yours won't either. Hugs and love. I love your projects! Elizabeth is so pretty! I know what you mean by up and down. You were closer to Lisa so I'm sure you feel it even more. Hugs to you -- hang in there. All of your WIP's look great! I just started stitching on 40 count and am loving it! Over the weekend I ordered a bunch of Primitive Needle patterns. I did not know her, but I know this must have hit you hard considering you stitched many models for her. You have been in my thoughts. It is good we have stitching, right? It always brings me comfort. Elizabeth is looking wonderful and I love your new starts. I always find in times of great stress and loss that my sewing helps me cope with what I am going through. I once read about how colonial women would pour all their grief into things such as quilts etc to help them cope with the loss of loved ones. I have done the same and it really does help. Hang in there. You along with Lisa's family are all in our thoughts - Sandra. You are my idol!!! Love your projects and looking forward to watching them progress :-). Very nice Nicole! Love the Needlework Basket.. can't wait to see more of that one. Nicole, I have the hang all your troubles on the line, chart also. I know I will want to do it sooner rather than later after seeing your progress...:). WOW! Very beautiful and original blog, I like it! 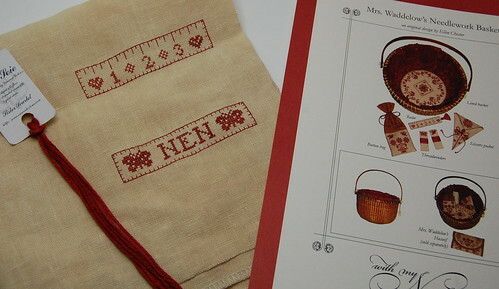 Your choice of patterns & threads is always so perfect - I really like the Needlework Basket !! wish I lived closer so you could help me pick out fabric colors.....you have a great eye for color!!!! Nice work on Elizabeth! Absolutely love your start on Mrs Waddelow's Needlework Basket - your thread and linen are a perfect choice.